What began in 1997 as one of the first corporate tech events, Oracle OpenWorld shares credit with a handful of other brands for the rise of b-to-b experiential marketing, the standardization of the annual conference format—and, most of all, the emergence of the proprietary mega-event. Now comes a new chapter as the tech giant’s event team rethinks, reimagines and redesigns the 55,000-person event as a more immersive, educational, collaborative and shareable experience. And amid it all, there’s a chance that Oracle might just be redesigning your b-to-b events in the process. The Howard Street plaza is now a changeable space for interaction and community, including morning yoga. Despite the explosion of spending on this sector, the b-to-b event model has remained largely unchanged for decades. General sessions pull crowds together. Breakouts push them apart. 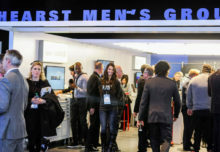 And exhibitors charged for the privilege of being in the same space as highly-sought-after buyers lay in wait across convention center halls for the chance to engage attendees. The b-to-b event attendee, however, has changed. They’re younger, they’re multicultural and they learn—and want to learn—differently than the attendees of yesterday. This new attendee generation is also the first to ask for less content at b-to-b events and more opportunities for peer-to-peer learning and interaction. 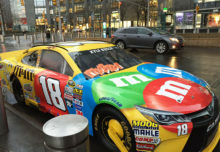 Over the last few years, a growing number of marketers have woken up to the clear and present need to refresh their b-to-b events—resulting in innovations ranging from the campus format that turns exhibit halls into singular content environments and second-screen experiences that amplify the event to cloud attendees, to alternative session formats that attempt to dial down tired PowerPoint snooze-fests and new peer-to-peer activities that let attendees hang with attendees. 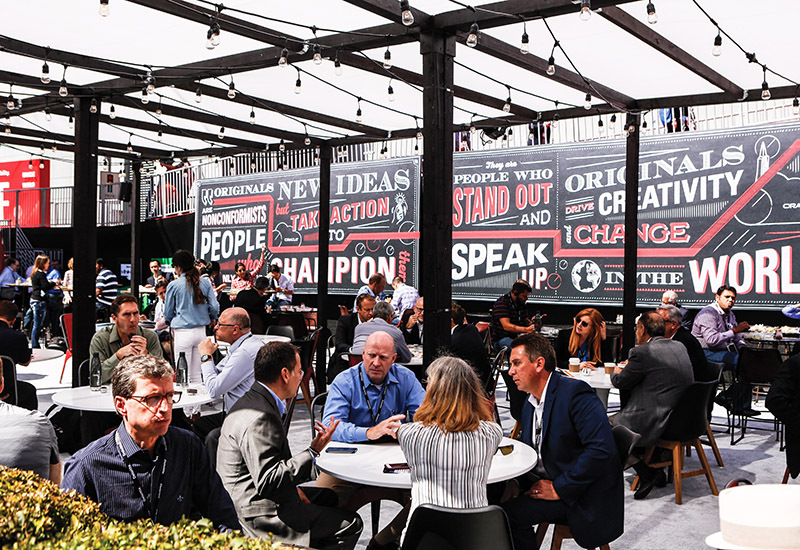 Looking to go beyond the mere “format tweaks” that other brands have instituted at their b-to-b events, Oracle in 2015 went against industry norm by retaining b-to-c shop Mosaic to help reinvent one of the industry’s longest-running b-to-b events. What began with a few test experiences at OpenWorld 2015 yielded impressive results on-site and substantial internal excitement around a full reset of the property. And so, a year later at OpenWorld 2016 earlier this fall—held as always at San Francisco’s Moscone Center—Oracle and Mosaic were back at it again, this time deploying Phase One of a new strategic blueprint that will, over several years, completely reinvent and reimagine the modern b-to-b event. The Phase One strategy deployment was focused on three main areas: redesigning collaborative spaces, deploying an all-new storytelling strategy and rethinking event learning. SPACE. With attendees now putting more of a value on spending time with other attendees, OpenWorld common areas were redesigned as organic, attendee-to-attendee engagement spaces. The anchor of it all was the Howard Street area sitting between Moscone halls, turned into a branded plaza that gave tens of thousands of people “gathering hubs” to use for conversation and collaboration. Attendees entered through a tunnel, providing a grand unveil and “for the first time, a sense of arrival,” says Mosaic senior director-client service David Grass. Upgraded food options served from redesigned concession areas (boasting reclaimed wood, earthy tones and music) turned typical event meals into atypical meal experiences. Rather than push attendees to leave the event during breaks to find food around San Francisco, the new thinking was to bring the cuisine of the city to the event—so attendees didn’t leave. An all-new branded Café on Howard Street was wired to a custom bookable OpenTable-esque system that gave Oracle’s own sales reps the ability to reserve tables for al fresco business meetings—a huge upgrade from the convention center meeting rooms they’d been using for decades. General sessions were livestreamed to media walls on Howard Street “so for the first time, attendees could sit in the sun and enjoy a keynote,” says Grass. It was a literal breath of fresh air. “We’re rethinking how people congregate and the spaces we give them to congregate in,” says Salinger. Oracle also mixed in audiences from its various marketing initiatives—in one case using OpenWorld to cross-pollinate high school students and IT professionals: Moscone North’s lobby became the backdrop to Oracle Education Foundation’s (OEF) Design Realization Garage (DRG), featuring Design Tech High School (d.tech), the public school for which Oracle is building a home on its headquarters campus. The DRG was a fun, interactive maker space, where d.tech students showcased innovative prototypes developed in OEF workshops. Attendees could explore the unique partnership between OEF and d.tech through interactive experiences rooted in technology, innovation and design thinking, using open hardware and a variety of prototyping tools and materials. And in an effort to also redesign the actual schedule of the event—the stoic 9-to-5 event schedule is in desperate need of change, folks—Oracle programmed early morning and evening activities and content. Case in point: the company brought its longtime ties to sailing to life with on-site interactives with actual Oracle Team USA athletes and trainers offering chats, chalk talks, photo ops and even early morning workouts. STORY. And then there was the content. No b-to-b event has ever created this much content in advance of an event or embraced this ambitious of a content “storytelling” strategy. Mosaic spent six months interviewing Oracle executives, customers and social media influencers, turning it all into more than 250 hours of content beamed online and around the event as living, breathing stories that “brought the OpenWorld experience to life,” says Oracle vp-corporate events Tania Weidick. As if inspired by the media walls lining the Las Vegas strip, screens placed throughout the Howard Street plaza broadcasted the content all day long. 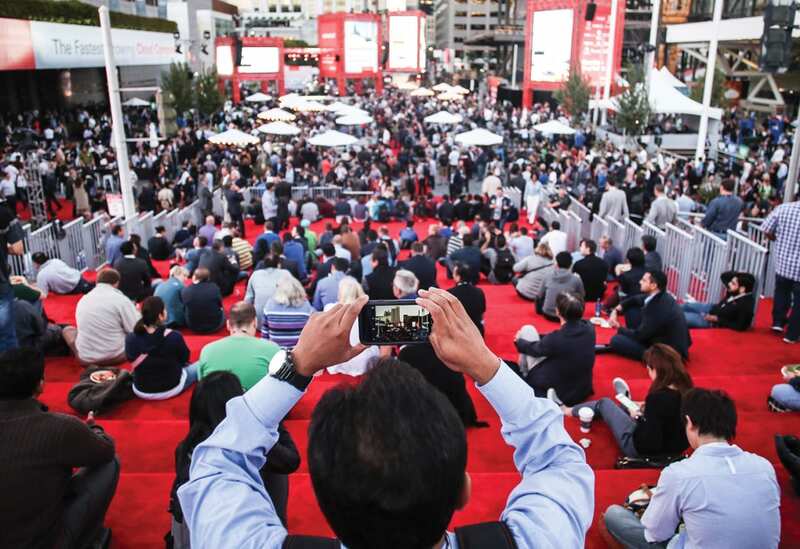 Oracle is rethinking how and where attendees congregate at OpenWorld. Indeed, all eyes are on Oracle’s next moves. With all metrics showing the strategy is working, the company now begins the process of taking Phase One of the OpenWorld reinvention to the next level with a Phase Two deployment in 2017. Oracle will continue to focus on evolving the common spaces, bringing to life more elements of peer-to-peer networking and reformatting the event schedule around the rapidly changing behavior of a rapidly changing attendee base.